Localization of PIK3CA mutations (relative to functional domains of encoded protein p110α) in colorectal and endometrial cancer by MSI type. Image provided by Drs. Stacey Cohen and Colin Pritchard. A newly defined type of colorectal and endometrial cancer involves at least two somatic mutations in the mismatch repair genes (MMR): MLH1, MSH2, MSH6, PMS2. This double somatic MMR cancer has no germline mutations in the MMR genes, unlike tumors due to hereditary Lynch syndrome. Double somatic MMR cases, along with Lynch syndrome and MLH1 gene hypermethylation cases, exhibit microsatellite instability (MSI). This hypermutable phenotype is caused by the loss of DNA mismatch repair activity. There is a need to improve our understanding of the molecular features distinguishing these three MSI subgroups. Doing so can better inform future cancer risk and can potentially lead to new therapies. Drs. Stacey Cohen (Clinical Research Division), Colin Pritchard (Department of Lab Medicine), and colleagues sought out to accomplish this. The investigators compared the molecular features of double somatic MMR, Lynch syndrome, MLH1 hypermethylated, and microsatellite stable (MSS) colorectal and endometrial cancers. Specifically, they examined the mutation prevalence among these cancer subgroups, focusing on mutations in five key genes in the epidermal growth factor receptor (EGFR) and phosphoinositide-3-kinase (PI3K) pathway: KRAS, NRAS, BRAF, PIK3CA, and PTEN. The results from their study were recently published in Gastroenterology. Using two prospective studies, Hereditary Nonpolyposis Colorectal Cancer Study and the Ohio Colorectal Cancer Prevention Initiative, the investigators identified double somatic MMR patients as those with colorectal and endometrial tumors who had two or greater somatic (but not germline) mutations in MMR genes. Using targeted next-generation sequencing, they found among colorectal cancer cases that that 14/21 (67%) of patients with double somatic tumors also had PIK3CA mutations, compared to 4/18 (22%) of tumors from patients with Lynch syndrome, 2/10 (20%) tumors with MLH1 hypermethylation, and 12/78 (15%) tumors with microsatellite stability (Fisher’s exact test, P<.0001 for patients with double somatic tumors vs. other subgroups). Among endometrial cancer cases, mutations in PIK3CA were detected in all 13 patients with double somatic tumors (P=0.04 compared to other subgroups). Using The Cancer Genome Atlas as an independent validation dataset (113 patients with colorectal tumors, 178 endometrial tumors), they found similar results: 100% of double somatic MMR cases carried a somatic mutation in PIK3CA (P<.0001 compared with other subgroups). Dr. Pritchard comments on how these results could influence testing and possibly treatment of colorectal and endometrial cancer patients, "Many patients with colorectal and endometrial cancer have their tumors evaluated for MSI to screen for genetic predisposition to cancer caused by Lynch syndrome. Our study suggests that mutations in PIK3CA are more frequently linked to a specific mechanism of microsatellite instability that is not related to Lynch syndrome. The findings have implications for interpretation of MSI testing, and possibly for treatment selection, as PIK3CA mutations have been associated with responses to therapy." Dr. Cohen elaborates, "We are now recognizing that colorectal cancer is made up of many different types that can be categorized by genetics changes in the tumor. Lynch syndrome is well known for the associated increased predisposition to colorectal, endometrial, and other cancers. We described cancers that can mimic the changes in Lynch syndrome. This has important implications for trying to tailor treatment to an individual patient’s cancer." In terms of future direction, Dr. Pritchard notes, "From the standpoint of tumor biology, it would be useful to study the underlying mechanism for the higher frequency of PIK3CA mutations in double somatic colon and endometrial cancers. From the standpoint of clinical care, we need to study how PIK3CA mutation status may be used to assist in MSI testing and Lynch syndrome workup." Funding for this study was provided by Congressional Designated Medical Research Program, Pelotonia, the Young Investigator Award from the Prostate Cancer Foundation, the Young Investigator Award from the Conquer Cancer Foundation, the Seattle Cancer Care Alliance Development Funds, and the National Institutes of Health. Cohen SA,Turner EH,Beightol MB,Jacobson A,Gooley TA,Salipante SJ,Haraldsdottir S,Smith C,Scroggins S,Tait JF,Grady WM,Lin EH,Cohn DE,Goodfellow PJ,Arnold MW,de la Chapelle A,Pearlman R,Hampel H,Pritchard CC. 2016. 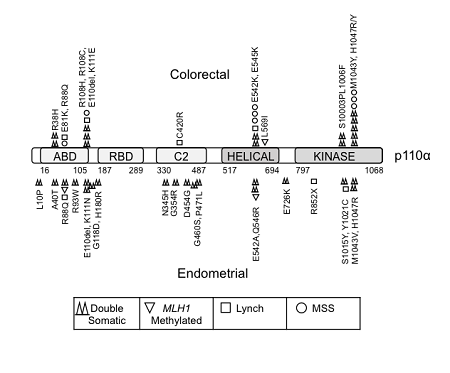 Frequent PIK3CA Mutations in Colorectal and Endometrial Tumors with 2 or More Somatic Mutations in Mismatch Repair Genes. Gastroenterology. Epub ahead of print.